In the latest episode of Keeping Up With The Kardashians, Kris Jenner and Bruce’s mother Esther finally put their differences to one side but not without a bit of drama first. Bruce Jenner decided to fly his 87-year-old mother to Los Angeles after her third husband died. “It’s kind of lonely around here,” the pensioner confessed on the phone after 95-year-old Frank passed away. Bruce Jenner, who admitted his relationship with his mother has had its “ups and downs”, hatched a plan to bring her from rural Idaho to see her grandchildren, and mark her birthday. But the plan didn’t initially inspire his wife. “Your mum doesn’t really like me,” Kris Jenner told her husband. “You’ve had no relationship with her for the last 15 or 18 years,” Bruce Jenner shot back. “I’ve seen her four times in my life. She yelled at me,” said Kris Jenner, who said she was saddened at the way Esther treated her. “Just have her see you as you are,” said Bruce Jenner, who wanted the pair to mend their relationship. Bruce Jenner later complained to step-daughter Khloe Kardashian, saying Kris could hold a grudge for 20 years. “My home is open to her,” said Kris Jenner, who insisted she was extremely busy. “I don’t think she’s really crazy about me,” Kris Jenner later confided to pal Rhonda over drinks, telling her it was “f*cked up” that Esther hadn’t wished to see her grandchildren grow up. “Why am I crying?” asked Kris Jenner. “This is a great thing,” Rhonda advised her. Bruce Jenner later asked his mother to try and make amends with Kris. “I have never felt that I could reach out to Kris,” Esther admitted. 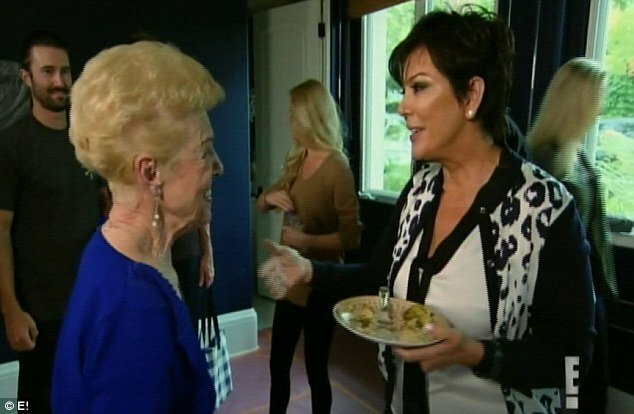 “It’s kind of awkward,” said Kris Jenner, who was reluctant to greet her guest, who again complained that she hadn’t ever got approval from Esther. “I hope that she can find a way not to judge me anymore,” Kris Jenner said. During a special dinner, the family began to warm to the outspoken pensioner as she told Kendall Jenner she was too skinny – like her – and needed to put on weight. And after a whisky cocktail Esther begins to talk about how she won’t wed again – and how any prospective husbands probably won’t be able to “get it up”. “I’m so happy you’re here,” Kris Jenner told Esther – before saying she had to leave early to look after Kim. “If I’m that sassy at 87, I’m going to be really happy,” she added. However, Bruce Jenner still wanted the women to iron out their differences – and brought her to the house the following day. “I really wanted a little time with you,” Esther said. “We haven’t been too close in any way. “It was very complicated, a lot of personalities in the mix,” Kris Jenner said. “I felt like I should stay away, and I have. But it’s not right. You’re Bruce’s wife. And the longest marriage he’s had,” Esther added. “Wow, I’ve waited 23 years for this,” Kris Jenner said, before the pair hugged and kissed. “I’ll go home singing,” Esther said. Meanwhile in Sunday night’s episode, Kim Kardashian fears she may be losing her clothes sense as she meets with Khloe and Kourtney about their fashion line. Kim Kardashian was mocked by sister Khloe, who accused her of Tumblr-stalking her in a bid to regain her “cool”, as Kim wondered how she could get the-then fifteen-year-old to post more images of her online.